State University of New York at New Paltz, M.S. Social policy, evidence based practice, and knowledge development, to promote positive youth development and success in education, work, and civic life. Focus on environmental influences and positive developmental settings for cognitive, intellectual, physical and social-emotional growth. Evaluation design, implementation, utilization, and capacity building for managers. Focus on evaluation as a management and learning tool for continuous improvement and sustainability. Application of systems thinking, logic models, and ecological modeling for complex, messy social change initiatives. Facilitative leadership for cross-sector partnerships and governance structures. Environmental Stewardship and Conservation Education. Susan P. Curnan is a professor of Social Policy and Management at the Heller School where she is a founding chair of the MPP and MBA concentration in children, youth and families, and served on the founding committees for both degree programs. She joined the Brandeis faculty in 1983, after brief management stints in philanthropy, non-profit management, government, and private business. Always focused on education equity, the environment and the economy, Professor Curnan is a big believer in cross-sector partnerships and interdisciplinary studies to address society's most vexing problems. An ecologist, science educator, and hands-on manager by training and experience, Curnan brings an ecological perspective and results-oriented leadership to all of her work at the Center for Youth and Communities, with university-community partnerships and in classrooms, as well as Board rooms. During her tenure at the Heller School, where "knowledge advancing social justice" defines the mission, she has taught more than 110 courses to hundreds of graduate students. 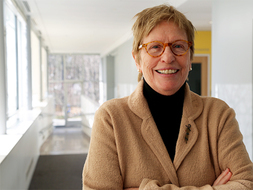 In 2018, Professor Curnan was elected for a fourth term as President of the Brandeis University Faculty Senate, the elected representative body of the faculty, and Chairs the Senate Council which advises and consults with the President, Provost, and Board of Trustees on University governance matters. •	Using science-based research to improve the quality and impact of positive youth development and student-centered education programs and policies. •	Strengthening governance, leadership and management in education systems, from secondary to higher education, philanthropy, government, the non-profit sector. •	Developing and using outcome-based planning and evaluation methods to deepen public understanding, strengthen and prove the efficacy of particular programs, and shape policies. The Center's work under Curnan's leadership has been generously supported by government and philanthropy for more than three decades. Funders include: USDOL; CNCS; The Nellie Mae Education Foundation; The Bill and Melinda Gates Foundation; Walmart Foundation; The Skillman Foundation; FIRST; W.K. Kellogg Foundation, Boston Symphony Orchestra (BSO), and Heidenreich Foundation. Others are listed on the CYC website. Grant and contract support under Curnan’s leadership has exceeded $80M during her tenure. Over the years, Professor Curnan has been a frequent keynote speaker at National and International Conferences, a consultant for the National Academy of Sciences, The White House Domestic Policy Council, UNESCO, and state and federal policy agencies in addition to philanthropic partners. Please see the Center for Youth and Communities website at Brandeis for detailed information on our people, projects and publications. Curnan, Susan P, Hughes D.M.. Results Oriented Thinking and Action: Using Logic Models for Effective and Sustainable Student-Centered Learning Practice.. For The Nellie Mae Education Foundation, Quincey, Ma. : 2018. Curnan, Susan P., Hughes D.M.,. Closing the Opportunity Gap: A New Norwalk Partnership Initiative.. Commissioned by the Per and Astrid Heidenreich Family Foundation, Stanford, Ct.: 2018. Curnan, Susan P et al. Donor Policy Brief: Summer Youth Employment: A Guide to High Impact Investments. Sillerman Center for the Advancement of Philanthropy: 2016. Curnan, Susan P et al. Series of Donor Policy Briefs on High Impact Investments: STEM programs for Girls; Homeless Youth; Youth Civic Engagement; Child Hunger Alleviation;. Sillerman Center for the Advancement of Philanthropy: 2016. Curnan, Susan P with Lisa A. LaCava, Susan Lanspery, Della Hughes. Report: Employment for Youth with Trauma Histories: Lessons from Research and Experience. Center for Youth and Communities, Walmart Foundation. : 2016. Curnan, Susan P, Hughes, D.M.. Knowledge Development Brief: Are We Helping? How Do We Know? A Report on Technical Assistance in Education Reform. Nellie Mae Education Foundation: 2016. Curnan, Susan P. "Theory and Practice." Rev. of Comprehensive Community Initiatives for Positive Youth Development, by Jonathan F. Zaff, Elizabeth Pufall Jones,Alica E. Donlan, and Sara Anderson. 2016: 178. Curnan, S. P., Hughes, D.M., Lanspery, S., Singleton, S., LaCava, L., O'Sullivan, K.. Enough is Known for Action! Ready to Employ, Educate, and Support Youth Brandeis University Briefing - A Photo-Text Summary. Waltham, MA: The Center for Youth and Communities: 2015. Curnan, Susan P. "Banner Years: After Three Decades, Enough is Known for Action. The Center for Youth and Communities has Long Been Fueling It.." Heller Magazine Summer 2015. Curnan, Susan P.,(co-author) with Erickson Warfield, M., Lanspery, S., Hughes, D.M.. Employment for Youth with Disabilities: Past Challenges and Future Opportunities. Center for Youth and Communities and the Walmart Foundation: 2015. Curnan, S. P., Lord, B.. Systems Change for Student-Centered Learning: A New Logic for District Level Systems Change. Quincy, MA: Nellie Mae Education Foundation: 2014. Curnan, S.P., Lanspery, S., Kingsley, C., LaCava, L., Hughes, D.M., Melchior, A., & Perlmutter, A. Practical Advice Guides: Smart Strategies to Employ, Educate and Support Youth in Employability Development Programs. Waltham, MA The Center for Youth and Communities: 2014. Melchior, A., Curnan., S.P., Lanspery, S.. Creating New Pathways to Postsecondary: Evaluation of the Bill and Melinda Gates Foundation's Postsecondary Success (PSS) Initiative. Waltham, MA: The Center for Youth and Communities: 2013. Melchior, A., Lanspery, S., & Curnan, S.P. Postsecondary Success Initiative Fact Sheet: Supporting Low-Income Youth to and through Postsecondary Education, Careers, and Community Leadership. Waltham, MA The Center for Youth and Communities: 2013. Curnan, Susan P, Lanspery, S., Kingsley, C., LaCava, L., Hughes, D.M., Melchior, A., & Perlmutter, A. Reconnecting Systems to Reconnect Youth: The Walmart Foundation's 2012 SMART SUMMER initiative to employ, educate, and support youth. Waltham, MA The Center for Youth and Communities: 2012. Curnan, Susan P., Hahn, A., Bookman, A., Hughes, D.M., Jacobs, C., Isenberg, L., & Rabinow, L. Moving From Talk to Collective Action: Effective Strategies for Alleviating Hunger and Food Insecurity in America, A Report on Brandeis Research and Interviews with Members of the Corporate Coaltion. Waltham, MA The Center for Youth and Communities and The Sillerman Center for the Advancement of Philanthropy for the Corporate Coalition Fighting Hunger in America: 2012. Hughes, Della M., Susan P. Curnan, Lisa A. LaCava, and Sheri Dursin. Unitarian Universalist Association "Leap of Faith Evaluation Report: Growth and Vitality in the UU Congregation". 2012. Curnan, S.P., Lanspery, S., Kingsley, C., LaCava, L., Hughes, D.M., Melchior, A., & Perlmutter, A. The Walmart Foundation's 2011 Investment in Summer Youth Employment: Encouraging Results and Lessons Learned. Waltham, MA The Center for Youth and Communities: 2011. Curnan, Susan P, Della M. Hughes and Susan Lanspery (eds.). Curnan/Hughes, Co-PIs. Resilience, Resolve, Results: A Compilation of Readiness Phase Studies of The Skillman Foundation's Good Neighborhoods and Good Schools Initiative, 2008-2010. 2011. Curnan, Susan P., Della M. Hughes, Susan Lanspery. Curnan/Hughes, Co-PIs. From Tower to Ground: Systems and Policy Change in the Good Neighborhoods/Good Schools Initiative. 2011. Hughes, Della M., Erika Moldow and Susan Lanspery. Curnan/Hughes, Co-PIs. Changing the Odds for Kids: Part 1 and Part 2. 2011. Hughes, Della M., Erika Moldow, Susan Lanspery, and J.F. Morgan Associates. Building Neighborhood Capacities to Support Youth and Families in Good Neighborhoods and Good Schools Initiative. 2011. Hughes, Della M., and Susan Lanspery. Curnan/Hughes, Co-PIs. Resilience, Resolve, Results: Background of the Readiness Phase of The Skillman Foundation's Good Neighborhoods and Good Schools Initiative. 2011. Curnan, Susan P, Andrew B. Hahn, Lawrence Neil Bailis, Joseph Frees, Christopher Kingsley, Lisa A. LaCava, Susan Lanspery, Alan L. Melchior, Erika Moldow. Innovating Under Pressure: The Story of the 2009 Recovery Act Summer Youth Employment Initiative: Chicago, Detroit, Indianapolis & Marion County, Phoenix & Maricopa Count. Employment and Training Administration (ETA), US Department of Labor. 2010. Curnan, Susan P. "Memories and Lessons from Eleanor Roosevelt's Kitchen Cabinet, 1931-1970." The Hudson River Valley Review: A Journal or Regional Studies Vol.26, No.1. Autumn 2009 (2010): 9-20. Curnan, Susan P. "The View from Val-Kill." Brandeis Magazine Fall 2010: 20-25. Susan P. Curnan, Christopher Kingsley, Lisa A. LaCava, Alexandra Pineros Shields. Emergency Assistance (EA) Reform in Massachusetts: A Report from Ten Regional Forums. Center for Youth and Communities, Heller School, Brandeis University. Boston: 2010. Susan P. Curnan, Christopher Kingsley, Lisa A. LaCava, Joseph Frees. Unfinished Work: Building Excellence in Washington DC's Summer Youth Employment Program. Center for Youth and Communities, Heller School, Brandeis University. Washington: 2010. Curnan, Susan P. "Memories and Lessons from Eleanor Roosevelt's "Kitchen Cabinet." A four-part series of articles." The National Trust for Historic Preservation Newsletter (2009). Curnan, Susan P. "Youth Development and Ordinary Days at Val-Kill Farm." Hudson River Valley Review (2009). Curnan, Susan P with Della M. Hughes. "Evaluation Readiness and the Culture of Learning". Edna McConnell Clark Foundation. New York City: 2006. Curnan, Susan P with Della M. Hughes. "Proving the Possible - Improving Systems: Transferable Lessons for Managing Growth and Change." A Report on Business Expansion 2004-2006. MY TURN, Inc. Brockton, MA: 2006. Curnan, Susan P. "Lobbying for Social Change." Rev. of Lobbying for Social Change, by Willard C. Richan. November 2006: Back cover. Curnan, Susan P. "The Power of Combining Youth Development Principles with Culture & Arts Programs: Findings of a Study of the Culture & Arts Youth Development Initiative". The Skillman Foundation. Detroit, MI: 2006.